♡♡♡♡♡♡♡♡♡ My heart is bursting as I write this. The Sydney Harbour National Park is not only an absolute diamond in the rough - a National Park right in the heart of the city (!! ), but it also holds a special place in our hearts as it’s our most frequented birding route. Living close enough to the park, I’ve birded it, walked it or ran it countless times. As most birders will tell you, there’s nothing quite like your own backyard. It’s the place you study without realizing it, becoming acutely aware of seasonal shifts, regular visitors and curious sights. 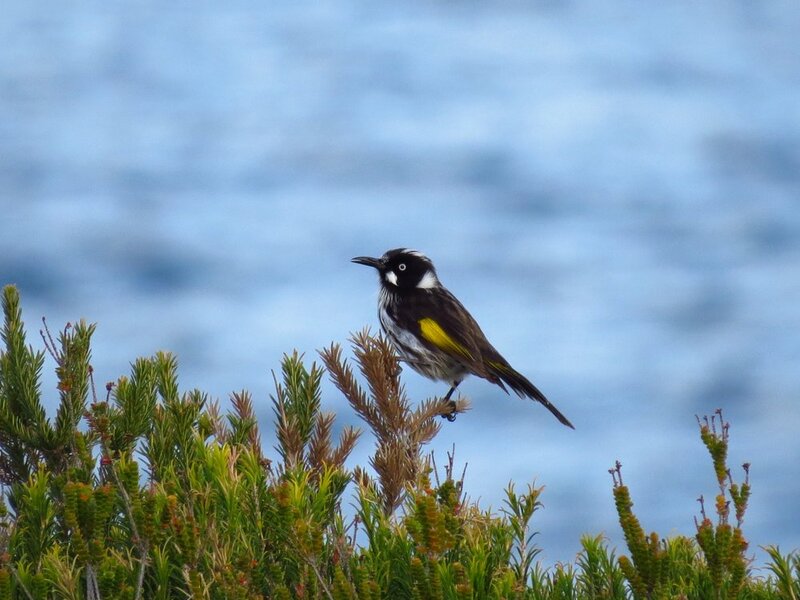 Running along the northern coast of Sydney Harbour, the Sydney Harbour National Park is a great place to go birdwatching. 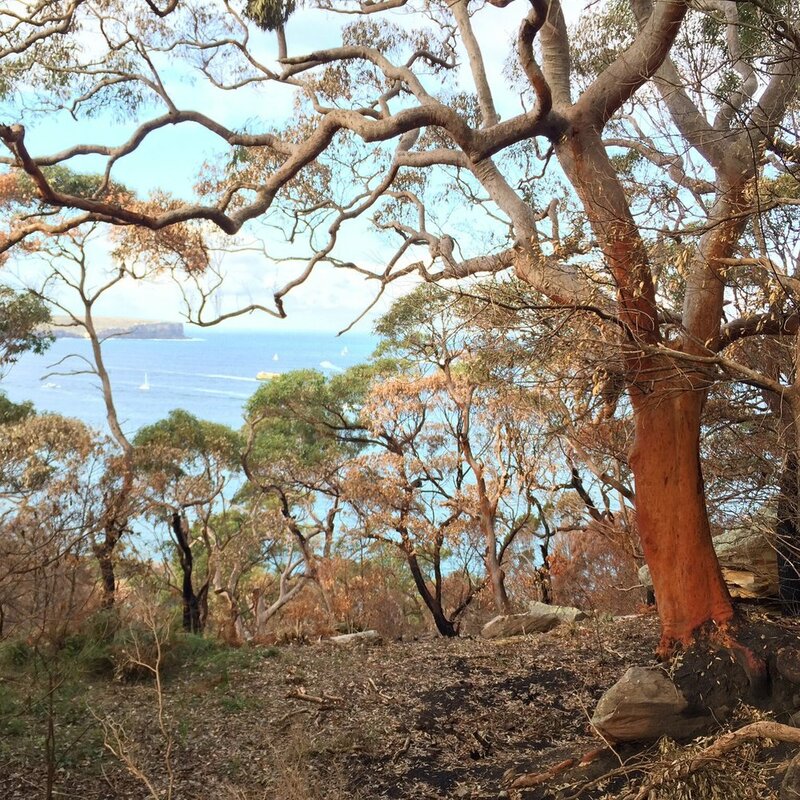 We recommend the route from Sirius Cove to Balmoral Beach, a path which will take you an entire afternoon (3.5-4 hours) allowing for stops to gape at birds and the harbour views. If you’re driving, park by Sirius Cove in Mosman (there is all day parking on the street) and bring your opal card to take the bus from Balmoral Beach back to your car. If using public transport, you can catch a bus down Raglan Street and get off at the intersection of Raglan and Mosman Street. You can take the steps at Illawarra Street down to Sirius Cove. Alternatively, if taking the ferry, the Taronga Zoo stop is just after the Sirius Cove portion of the path, so you will miss this section, but there is still plenty to see. When you get off the ferry, walk right up the hill on the sidewalk and at the pedestrian crossing to go into the zoo (on the left), walk down a slight hill into the national park. Before we begin, though, a word to the all you perpetually hungry muppets and true urbanites among us: fear not, there are some amazing eats along this route as well as plenty of coffee and rest stops. We’ll get into the details later, but first…. This segment can be particularly rewarding and one of the more active along the route. We’ve spotted lots of bird life in this area, including some that Sydnesiders rarely get to see up close. The path to enter the park from Sirius Cove is at the left of the beach (you will see some stone steps). Head up them and you’re on your way. Fun fact: Just off this path running alongside Sirius Cove was the home of a famous artists’ camp in the 1800’s called Curlew Camp. Rumour has it they were nudists…. Following the path alongside the stone wall of the Taronga Zoo, you will eventually turn the corner and come to an intersection of where steps lead down to a beach. Stay on the path. Do not be tempted by the sirens of the turquoise blue water. This point until the Taronga Zoo Ferry Wharf is especially good for bird spotting. 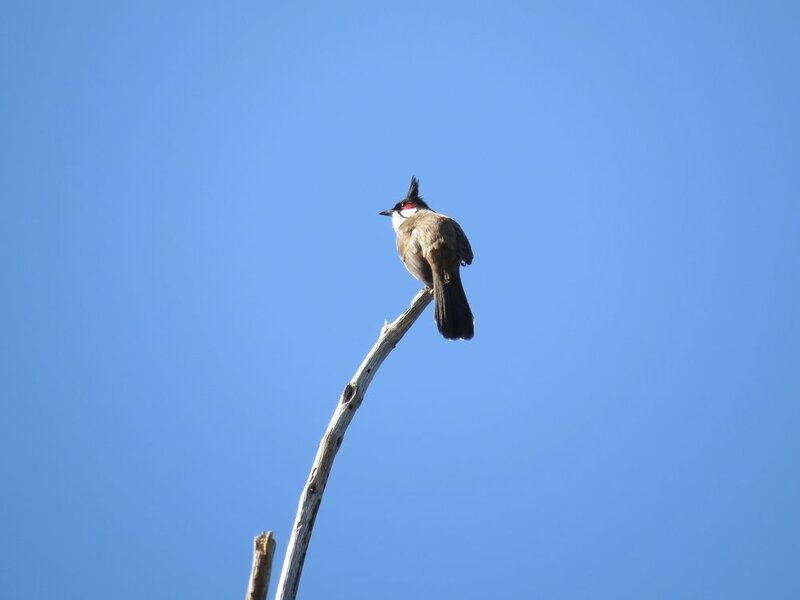 We frequently see Red-whiskered Bulbuls and Whipbirds here. Pro tip: look on the ground for the Whipbird if you hear it. 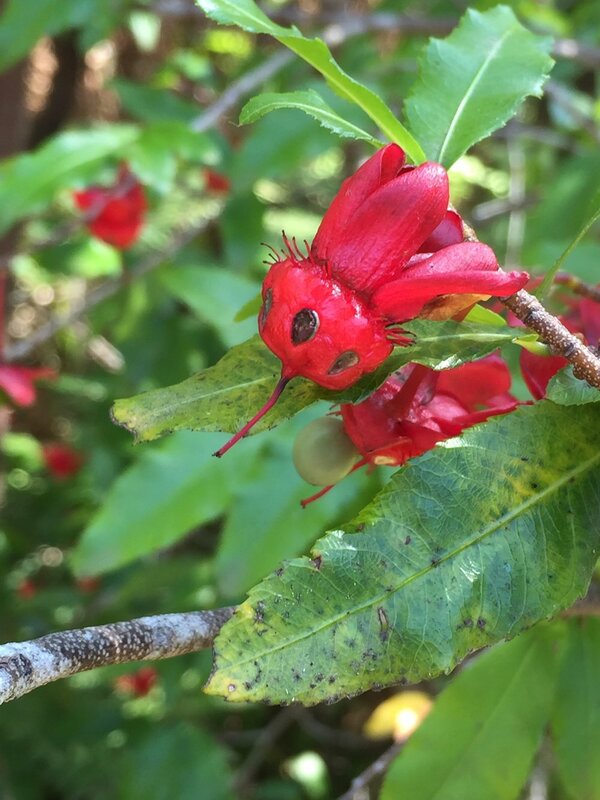 It can often be seen in the foliage on the ground and not the trees. 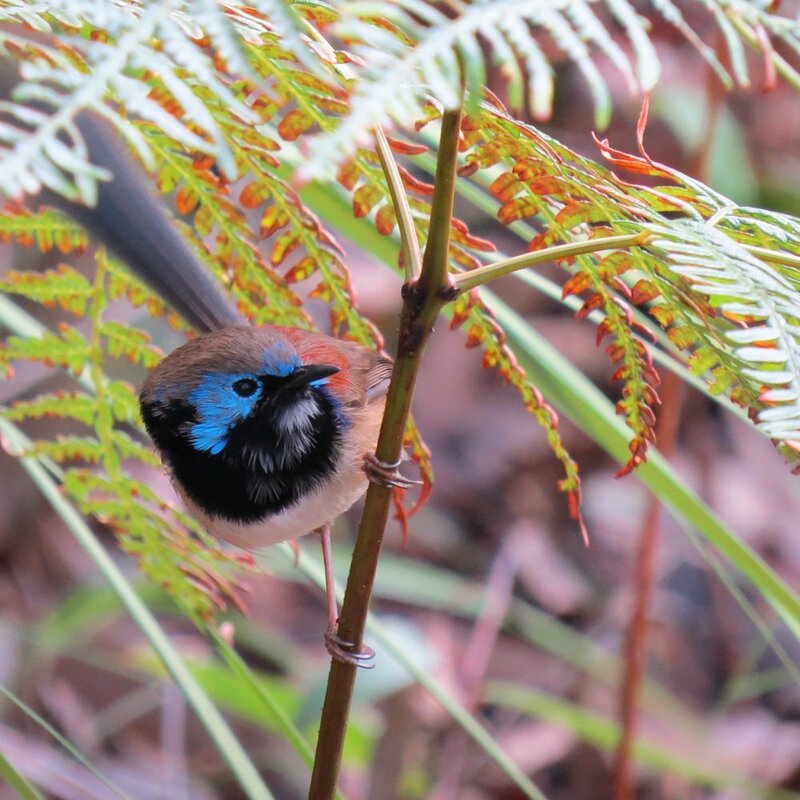 This area often has little birds too like Superb Fairy Wrens, Silvereyes and White-browed Scrubwrens. 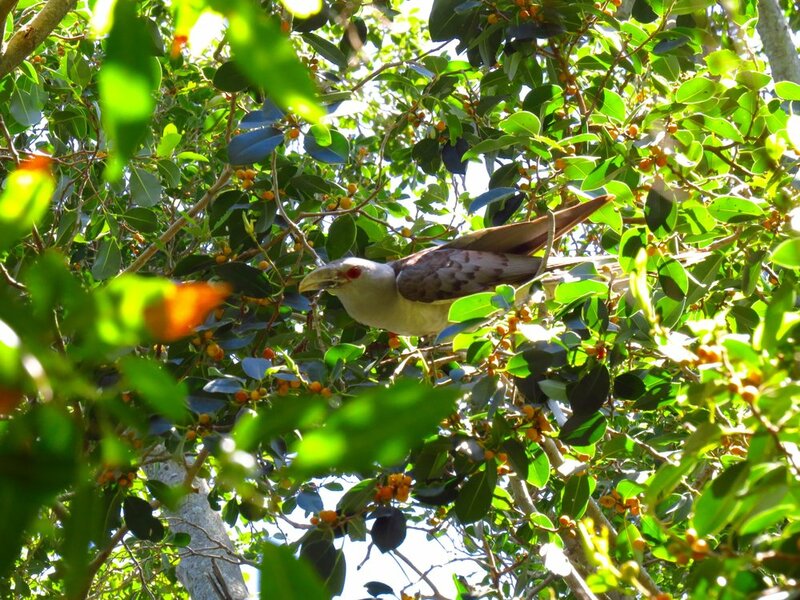 In the summer, this spot is a chance to see Channel-billed Cuckoos sitting very patiently on the trees waiting to get their photos taken. There are some spectacular trees along the boardwalk, and we’ve seen plenty in this section. Also in the summer this part of the path has Koels, those summer loving birds famous for their ‘koo-eee!’ calls. Pied Currawongs are also common here as well as Rainbow Lorikeets and Brush Turkeys. We’ve even seen Black-faced Cuckoo Shrikes and Crimson Rosellas along this section. Once you reach the Taronga Zoo Ferry Wharf, keep going up the sidewalk until you’re back in the National Park. The entrance is just to the right of the pedestrian crosswalk to the zoo entrance. If you have a small bladder, you can use the bathroom at the zoo entrance without paying an entrance fee. For partners of people with small bladders, you can sit just inside the zoo on a bench looking into a giant tank with delightful seals. This zoo entrance is through the gift shop, so if you’re hungry, grab an ice-cream before venturing out. We’ve spotted lots of little birds along the walk from the ferry to the national park and just inside. These are Spotted Pardalotes, Superb Fairywrens, Silvereyes and White-browed Scrubwrens. Once on the path, this section will take you through a drop dead gorgeous part of the path, alongside a magical gum tree forest (five minutes in). Walking on the boardwalk with the forest on your left and the sparkling blue harbour water on your right, you can see clearly to the city including the Sydney Opera House. I always do a double-take at this point, because it feels like you’re so much farther away from Sydney than you actually are. We haven’t seen much bird life on this section, but the beauty of the forest, the views and a surprising amount of lizards on a sunny day more than make up for it. 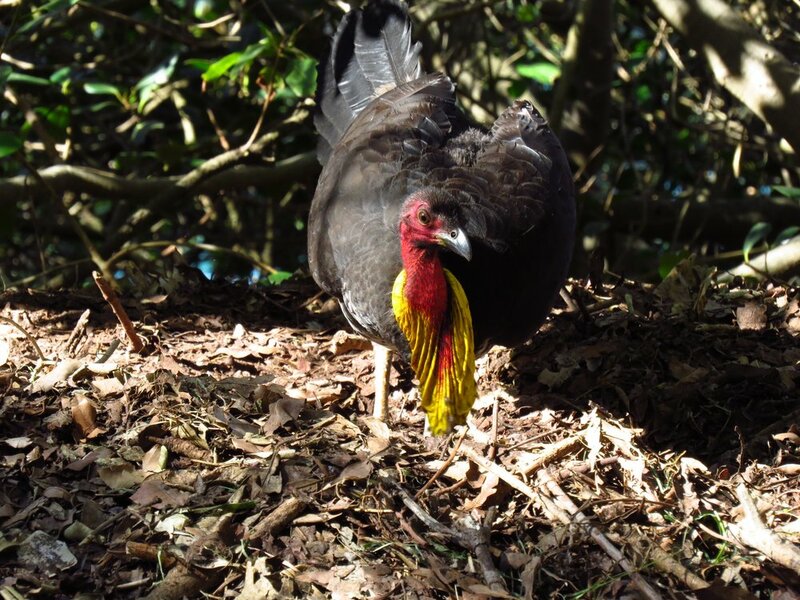 Getting closer to Bradleys Head, the bird life returns, often in the form of Brush Turkeys, Kookaburras and Pied Currawongs. Keep your eyes peeled for a turkey mound on the right of the path before Bradleys Head. This is the longest section of the walk and can be very rewarding for spotting birds. From Bradley’s Head, follow the sidewalk along the coast then back onto the path (there will be a gazebo on your left just at the entrance). This part of the path can be quite sunny, so make sure you have a hat and sunscreen. Little birds frequent this beginning section (first 15-20 minutes of walk) where low brush and ferns dominate. We’ve seen plenty of New Holland Honeyeaters, Superb Fairywrens, Variegated Fairwrens, Silvereyes, White-browed Scrub Wrens and Red-browed Finches along this path. Listen for frogs as there is some water that runs alongside the left of the path, especially in winter. This route will take you up plenty of steps and wind around back into a cool gum forest. Sulphur-Crested Cockatoos are king in this section. At the bend, you’ll step onto platform steps and a boardwalk which wind you to a small waterfall, however, in drought, though, it may not be there. But still, a waterfall in Sydney! Once you approach Taylor Bay, you’ll be walking on a track with houses to your left. This section can be very rewarding for spotting birds and we’ve seen New Holland Honeyeaters, Red-browed Finches and other birds along here. Keep your eyes and ears peeled for birds here. The rest of the path to Chowder Bay has had some burning in the last year, so may be quiet, although we’ve spotted plenty of wrens closer to Chowder Bay. We even nicknamed this part of the path (just before you emerge back into civilization at the top of Chowder Bay) as Wren Country. 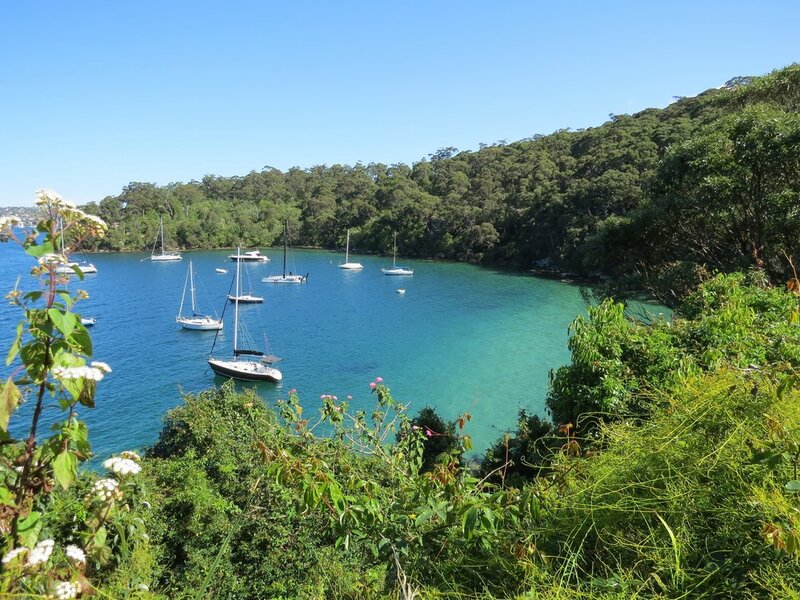 Ahhhh….Chowder Bay. What a site to behold as you emerge from the forest and wind your way down to the beach. Sparkling turqouise water that invites a swim even on a winter’s day, Chowder Bay is a respite for these particular things: mo’ food, mo’ water and mo’ bathrooms. Fill up your water bottle and hit the loo before exiting the beach where a Bacino Express waits to fulfill all your coffee dreams. Pro tip: they use shaved chocolate on the cappicinos. This is a good place to stop and sit with a cup of coffee overlooking the water and double-check your bird list and sightings for the day. The next bit of path is uphill, so stretch your legs, but know that the incredible and out of this world Frenchy’s cafe awaits you at the top for a bite to eat. After your coffee break, keep going and head up the set of stairs just to the right of Ripples. Up the steps, keep going until you hit the road. There will be a house/cafe on the right and the path to continue is to the left of this. It’s a steep ascent for a while, so take your time and recite a mantra while you climb (“I think I can….I think I can…”). Getting to the top is a real accomplishment. Pat yourself on the back and keep going. At the top there are some forks to the right (like the Gunners Barracks and George’s Head Lookout), but we usually stick to the path (there will be an early education centre on your left at the very beginning). This part of the path is unusually beautiful because not only does the lack of oxygen rose-colour your glasses, but you’re now up in the sky, with beautiful sweeping views of the harbour. One of the most delicious places to eat is Frenchy’s Cafe. Set outside, amongst Army Barracks that have been converted into artists studios, we recommend the quiche lorraine. I feel it’s my duty to tell you that I don’t like quiche, but this is an otherwordly experience and absolutely delicious. Their coffee is très magnifique as well if you need another cup. Help yourself to a water bottle refill and use the loos before you head back onto the track for the final descent down to Balmoral Beach. Exiting Frenchy’s back to the path, you will come to a road. Cross it, and walk over grates to get to the entrance of this section. Make sure to wipe to your shoes as instructed to prevent dieback. The best part of this last leg is that it’s all downhill. Enjoy the journey down and look for birdlife as you descend. We’ve seen plenty of brightly blue coloured fairywrens along this path and Sulphur-Crested Cockatoos and Crested Pigeons at the bottom. Emerging at the bottom onto a sports field you are done. Congratulations! Bathrooms are located on the sports field and make sure to have a walk along Balmoral Beach afterwards. If you’re feeling peckish the Boathouse has amazing food and coffee or we recommend Bottom of the Harbour for some delicious fish and chips (we like to sit on the beach and eat). What a journey you have had! The Boathouse - open daily until 4PM, sit outside over the water with a nice cold beer. Bathers’ Pavilion Cafe - if it’s after 4PM, head down to Bather’s Pavilion where you can sit and enjoy a drink at the bar and chat about the birds you’ve just seen. The Buena - looking for a proper pub? Take the bus up to Military Road from Balmoral Beach to the Buena where you can sit and drink pints on tap and talk about birds.